Picking up where the best of 1968’s legendary rock superstars left off, the all-new ROCK & ROLL CIRCUS is a cutting-edge marriage of the best of circus spectacle with today’s top musicians, creating a multisensory, explosive experience unlike any other live event available today. On January 4th, Saint Motel, Nick Zinner of the YeahYeahYeahs + Aska, Amazing Baby and Ariel Pink will perform alongside circus acts, with ringmaster ACID BETTY bands, while contortionists, balancing acts, jugglers, and acrobats fill the ring alongside. 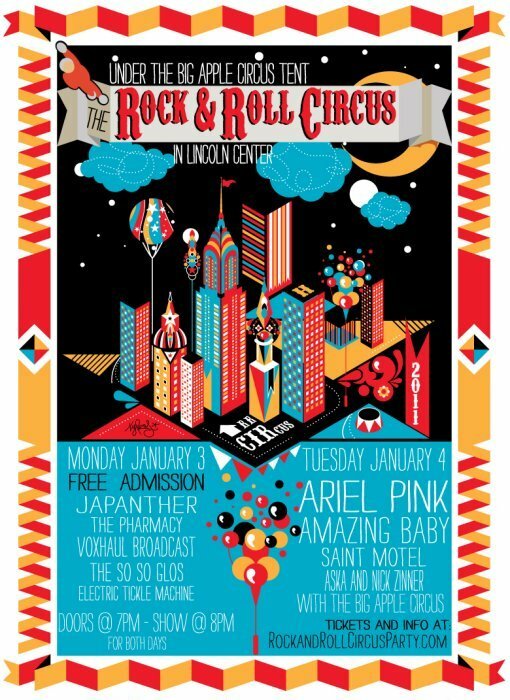 Admission is free for the first night of The Rock & Roll Circus (Jan 3) at Lincoln Center, but you can still buy tickets to the second night’s show (Jan 4) featuring Ariel Pink (who are a last minute replacement for cancelled headliners OK Go). More Ariel Pink 2011 tour dates after the jump.